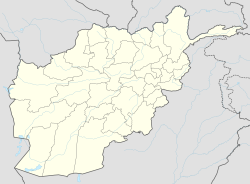 Asadabad or Asad Abad (Dari: اسدآباد‎ - Asadābād) is the capital city of Kunar Province in Afghanistan. It is in the eastern part of the country next to Pakistan. There are a lot of mountains around Asadabad. ↑ "Asadabad (Afghanistan)". Silobreaker. June 14, 2009. Archived from the original on June 16, 2009. This page was last changed on 20 July 2018, at 17:18.